Underrated and often overlooked until the draft, leagues like the USHL and OHL are enormous contributors to the growth of hockey. Much like other sports, the farm teams and junior leagues are never even a thought to the general public until a superstar emerges at the professional level from one of the junior teams. The NHL as a whole is an “underserved” league, as NHL Commissioner, Gary Bettman, describes it. Despite the lack of coverage up until recently, junior and youth leagues are showing enormous growth in the last year. With the record-setting growth in youth hockey nationwide, the USHL and OHL will only continue to grow in popularity and success. The USHL had a record-setting draftee participation in the 2018 NHL Entry Draft with 57 picks. 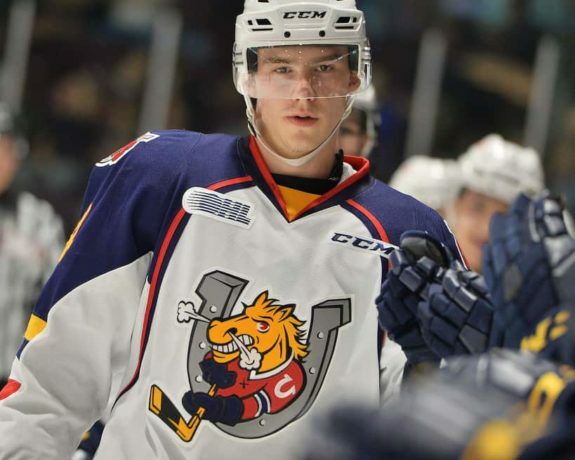 The OHL also contributed 35 total picks in this year’s draft, including the much talked about Andrei Svechnikov, brother of current Red Wing Evgeny Svechnikov. As the leagues gain momentum in terms of participation, their continued exposure will impact the NHL as a whole. “The impact in my mind is on building the game right here in the United States. The USHL has a focus on developing American talent and has done just that. I don’t think I even need to start listing USHL alum who are stars anymore, because most hockey fans already know them,” stated Scott Bradford, Media Director and Broadcaster for the USHL Muskegon Lumberjacks. For the Red Wings, junior leagues are the breeding ground for some of the best talent and development available on local soil. The USHL (United States Hockey League) consists of 16 teams throughout the US. In comparison to other junior leagues, the USHL is still in its adolescence, but likewise experiencing growth. Consisting of 17 teams around the country, the USHL has become a hub for junior athletes’ development for the NCAA or in some cases, the NHL. The USHL platform provides younger athletes a chance to train on and off-ice while being given a competitive edge when entering higher leagues. Hockey is a worldwide sport, and as such, the USHL isn’t exclusive to North American skaters. The USHL welcomes international juniors to play in the league. International players come from around the world to earn NCAA or NHL scouting attention in hopes of advancing their hockey careers. 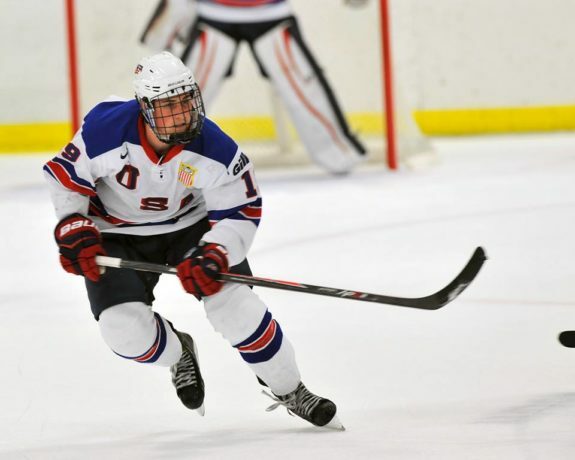 Though many of the North American and international skaters play in the USHL in hopes of getting NCAA attention, the reasons for such attention vary. For the domestic players, a college commitment results in tuition help, ongoing development in the game and a broader choice of school. 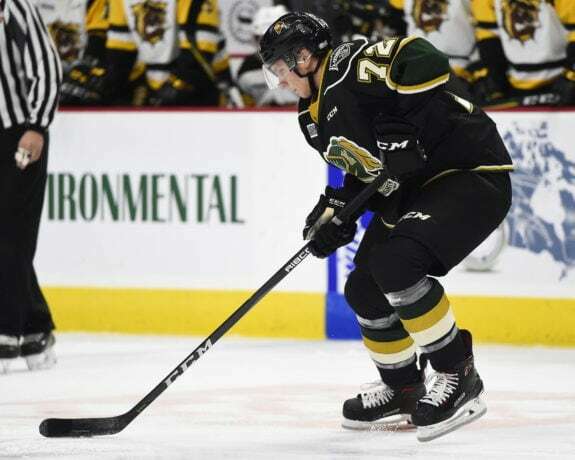 By earning college attention, the international athletes gain a foothold in North American hockey in general, getting them one step closer to the NHL—often their end game. The Red Wings have taken advantage of the unique talent that accumulates in the USHL. Justin Abdelkader, former Grand Rapids Griffin and current Red Wings forward, was a product of the Cedar Rapids Roughriders. Luke Witkowski, a native of Holland, Michigan, is a Fargo Force alumni. Nick Jensen, as well as Griffin’s defenseman, Vili Saarijarvi, both, have a USHL history with the Green Bay Gamblers. Danny Dekeyser, Dylan Larkin, and Jimmy Howard all spent time in development with the USHL prior to their NHL contracts. Clearly, the Red Wings, along with every other team in the NHL, recognizes the talent that can be extracted from junior development leagues. Having the advantage of up to four years in juniors prior to the NCAA, if their path to the NHL isn’t direct, these players have a unique competitive experience. The USHL also presents a comfortable cushion for the NHL teams looking to draft these youngsters. Often only 16-18 years old, they have several years to develop which allows the teams to monitor their growth closely over time. 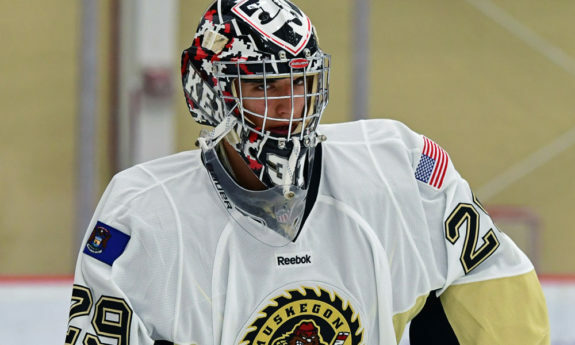 “What you’re going to see now, the way the rules are, you’re going to see a lot more kids to go to the USHL/college route because they have four years to sign them…” Art Regner stated. Given their age, the players, if committed to universities prior to being selected by NHL teams, the teams are allowed four years to make a decision to keep/sign the player or not. For the Red Wings, this allowed them to watch the growth of DeKeyser throughout his collegiate years, prior to signing him. The Red Wings are also able to continue monitoring the growth of draft picks from the previous few seasons such as Chase Pearson, Keith Petruzzelli, Jack Adamas, Kasper Kotkansalo, and newly-drafted Ryan O’Reilly. All products of the USHL system, each player will undergo rigorous challenges in the NCAA and requirements given by the Wings in order to make their game NHL ready. Without having to commit to each player long-term until the end of the four year period, the Red Wings have a comfortable window of time to observe each player for credible growth. The OHL (Ontario Hockey League) like the USHL, is a thriving junior league. Obviously, given the name, its roots are in Canada. Slightly larger than the USHL with 20 teams, the OHL has continued to see elite growth from its program. In the 2018 NHL Entry Draft, 35 picks were from the OHL. In the 2017 season, 171 OHL alumni were listed on 2017-18 starting NHL rosters. The OHL is part of the CHL (Canadian Hockey League), which accounted for more than 300 roster spots for the 2017-18 season. The OHL differs from the USHL in a few ways. 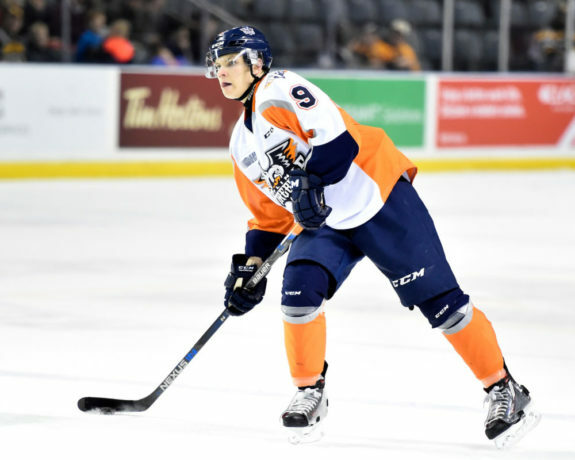 Geared more towards professional development rather than vastly NCAA aspirations, the OHL’s schedule and conditioning are more intense. Their season is slightly longer, 68 games per team compared to the USHL’s 60 games. The conditioning is also more frequent and demanding. The OHL is the closest junior players can get to pro training without actually being in the pros. Like with the USHL, the Red Wings have used the OHL’s driving competitive format to their advantage. Current Wing, Tyler Bertuzzi, was a star player for the Guelph Storm. Bertuzzi’s former Griffin’s teammate, Eric Tangradi is also OHL alumni along with Vili Saarijarvi who also had previous USHL experience. Red Wing Andreas Athanasiou also came out of the OHL system. Current Red Wings prospects Givani Smith, Brady Gilmour, Reilly Webb, Cole Fraser, Zach Gallant and Alec Regula are all currently playing in the OHL. The OHL doesn’t give NHL teams as much of a cushion as the USHL does, however. The format provides the NHL teams two years to decide whether or not they would like to sign their draftees to contracts. The time frame varies slightly based on their age and if they have any previous college experience, however, the general two-year commitment is the allotted time. Proper conditioning in the junior developmental years of NHL-hopefuls is crucial to the growth of the sport. The continued growth of the USHL and OHL leagues has given the Red Wings, along with other teams, a youthful competitive advantage. Having the athletes within close proximity allows the team to monitor their improvements. Two OHL teams, Saginaw Spirit and Flint Firebirds, reside in Michigan. Along with the USHL’s Muskegon Lumberjacks, which produced four 2018 draft picks, Detroit has the opportunity to have development right in its own backyard. With the outstanding growth this season, of USHL participation in the draft and ongoing OHL participation, it’s very likely that the Red Wings will continue to derive their youthful talent from those resources. Having a history with past, present and future players coming out of these elite leagues, the Red Wings have a firm grasp on their importance. The unique platform given to both leagues for training, competition, and development enhances the athlete’s abilities while giving them the opportunity for professional growth or collegiate growth—or both! Around the NHL, the OHL and USHL are leaving their footprint. Over the years, the importance and relevance of leagues such as these have been overlooked by the public. Unknown to many, there are future stars in many people’s backyards. Here in Michigan, we have the advantage of housing several teams from various leagues. Juniors are where many of these kids officially get their start. Its where they find their place on the ice and are molded into the players they’re meant to be. So often their names go unsung until its called at a draft. Unless you were a local in Erie, you didn’t know who McDavid was. If you didn’t follow the USHL’s USA Development Team, you wouldn’t have known where Larkin came from. Spawning off of this recent draft, it is my hope that the incredible talent selected from both leagues, along with many others, will inspire attention. Many of the young men I’ve spent seasons watching have moved on to pursue their NHL dreams. Being involved in juniors has given me the opportunity to be a part of their story. There’s something incredibly inspiring and humbling about laughing, screaming, and sometimes crying alongside these kids during their development years. They are fighting tooth and nail against hundreds of others in their league for a chance. Whether it’s for college or for the NHL, each player has a unique battle and story. If the public could only care then as much as they do on draft day, imagine how much the sport would grow. Each league, player, and journey is unique. It doesn’t start when they pull the jersey over their head on draft day, nor should our support.